We love to experiment with new tastes and sometimes cocktail inspiration strikes unexpectedly, often as a result of a new product arriving at a particular moment. And so was the case with the creation of this fantastically fresh and drinkable Burghley Bounder Cocktail, created during the 2018 Burghley International Horse Trials. Our insanely popular Seville Orange Gin was combined with our zingy Lime & Chilli Cordial, some very fine Red Gum Honey from our Scottish friend Shamus Ogilvy at Necta & Hive and some fresh lime juice to create a wickedly delicious cocktail that might even give a rider enough courage to bound their horse around the famously tricky Burghley cross country course....well almost!! To avoid freezing the honey, muddle the honey with the Seville Orange Gin, Lime & Chilli Cordial and fresh lime juice in a cocktail shaker without any ice until all the honey dissolves. Then add crushed ice and the remainder of your squeezed lime fruit chopped into smaller chunks. Shake hard and pour complete contents into suitable sized tumbler or rocks glass. Sip slowly and get ready to leap like a Thoroughbred! Please choose an apppropriately sized bottle of Seville Orange Gin 26% and Lime & Chilli Cordial from our Cordial range. Red Gum honey is our preferred ingredient for the Burghley Bounder Cocktail due to is delicious concentrated molasses taste. However, another good honey could of course be used. 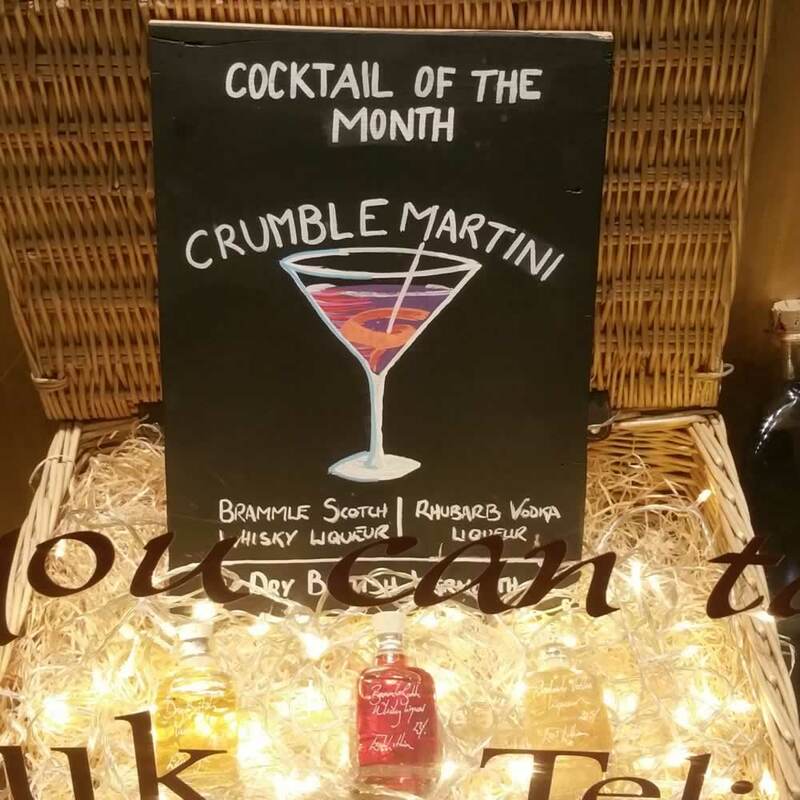 We have based our Demijohn Classic Dry Martini Cocktail on the original Dry Martini loved by the partying elite of the roaring 1920's. This drink famously re-invented itself in the Ian Fleming 1953 James Bond novel Casino Royale, where is earns the name Vesper Martini. The common theme with both forms of Dry Martini are that they are both large, strong, cold and well made with export strength spirits and use a very complex form of Dry Vermouth. Luckily for us we have most of the ingredients we need to create our small miracle. Our Demijohnnie Gin at 50% abv has certainly the strength required, and our handmade Dry British Vermouth 18% with is 24 herbs including Wormwod, provide all the complex flavours one could ever need. A word of warning for those new to the wonderful World of the Martini. While being a fiendishly good drink, the Martini can also be a devilishly strong drink. Beware! Finally, twist a small amount peel from a fresh lemon over the glass and drop into the drink to give your Martini a zesty lemon twist. Garnish with a slice of lemon on the glass for effect. First created during a fantastically hot week while we exhibited at Badminton Horse Trials in early May 2016, our Hold your Horses Cocktail is aptly named. Our smooth Rhubarb Vodka combines with our zesty Grapefruitcello and the zing of our unique Elderflower Vinegar to produce a delicious long drink, perfectly matched for a hot Summers day. Half fill a rocks glass with ice and add Rhubarb Vodka Liqueur, Grapefruitcello and Elderflower Vinegar. Top up with tonic water and muddle gently. 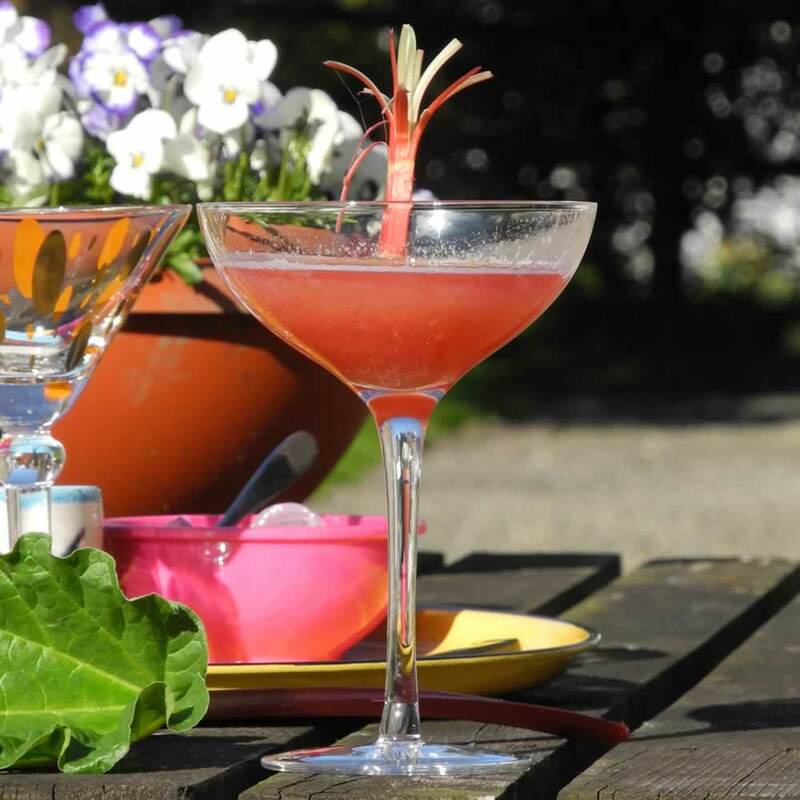 Garnish with a fresh stem of rhubarb or lime and then sip like a Show Jumper! The name Scottish Rose does not refer to the colour of the drink itself but rather the colour of one's cheeks after drinking it! This cocktail recipe was created for the Demijohn 2008 Staff Christmas night out by Alastair Simpson at which a cocktail competition was held between our Edinburgh and Glasgow shops. The Glasgow cocktail was called a Strawberry Moscow Mule. Although a draw was declared on the night, your comments on the success of each recipe would be much appreciated and can be posted online if witty enough! The ingredients of this cocktail can be bought as our Scottish Rose Gift Set. Take 2 classic Martini glasses, evenly split the 1/2 measure of Demijohn's Islay Blended Malt Scotch Whisky between the 2 glasses. Tilt each glass and spin slowly to entirely coat the inside of the glass with a film of the whisky and discard the remainder. Then take a Cocktail Shaker, and fill with ice. Add 2 measures of Demijohnnie Gin 50% and a single measure of Apricot Brandy Liqueur 17%. Shake vigorously and then strain evenly into the 2 prepared glasses to remove the ice. To finish the cocktail, drop in a whole fresh bramble (blackberry) and then serve. Highland Fuze is a long, refreshing, whisky sour cocktail drink with an explosive finish. It can quench the thirst of many on a warm Summer's evening in the most excellent way. Like all our recipes, there is a good story behind its creation. Each year from August Her Majesty The Queen heads with her family to her Scottish home at Balmoral in Royal Deeside for her summer holidays. To protect her and provide a Guard of Honour for a number of ceremonial duties a Company of about 100 serving Scottish Infantry Soldiers are allocated the task of forming the Queen's Guard. In 2015 this task fell to The 2nd Battalion The Royal Regiment of Scotland (The Royal Highland Fusiliers) of whom the Guard Commander was a personal friend. As part of the many duties of the Queen's Guard, they are required to host a number of high profile Cocktail Parties. We were asked to create a new cocktail drink that would be suitable for such occasions. After some tremendously fun experiments with the Officers' of the Queen's Guard and some inspired mixology based around a toffee apple from Demijohnnie Joe Rogerson, Highland Fuze was born. A cocktail drink not only delicious in taste, but also fit for Her Majesty The Queen. Choose a large tumbler style glass and add a generous quantity of ice. Squeeze in some fresh lime juice and add measures of both Toffee Whisky Liqueur and Somerset Pomona. Add a dash of Indian Tonic Water and muddle gently. Garnish with a slice of lime. Top Tip: Highland Fuze is ideally suited to being made in larger quantities and served from a jug at your drinks parties. If you like this cocktail recipe then you can buy the actual drinks for it as single bottles by clicking on the various product links in this recipe. It is not very often we all witness a total solar eclipse of the Sun, however on 20 March 2015 we did exactly that. Great Britain stood still at 9.30am to watch the thrilling sight. Excitement mixed with a little trepidation sent a slight chill down many a spine at the feeling of our planets vulnerability when the Sun's warming rays are extinguished for a few moments. That evening, however, we felt a need to party and create some new cocktail recipes using all our mixology skills. To celebrate this magnificent event our Solar Eclipse Cocktail was born! Mixing the deep dark strength of our unique British Walnut Liqueur 38% (The Moon) with the fiery spice of our smooth Ginger Wine 14% (The Sun) has produced an aperitif that not only resembles the remarkable natural event of the eclipse but can also make the hairs stand up on the back of your neck! Warning - Please sip slowly for this is a strong drink! This is designed as a short sipping drink, so choose a large tumbler style glass and add a generous quantity of ice. Add the Ginger Wine first, then carefully pour the measure of Walnut Liqueur into the centre of the glass to create the effect of the eclipse. Top Tip: You can use an ice mould shaped like a glass as we have done to hold the Walnut Liqueur in a central position to give best effect to your cocktail. This will allow you to watch the eclipse fade as the Walnut Liqueur is slowly released into the Ginger Wine. Finally, drink this slowly and hope that the next Solar Eclipse passes on 12 Aug 2026 as smoothly as this one did! Inspiration for our Lemon Weegie Cocktail came from the need to celebrate the Glasgow Commenwealth Games in July 2014 with a suitable drink. It is a refreshingly simple, long cocktail drink with a gentle surprise in its tail. You might say, easy peasy lemon weegie....! Place plenty of ice in a tall glass, squeeze in a little juice from a fresh lemon, add measures of Limoncello Liqueur and Elderflower Vinegar. Top up with tonic and muddle gently. Garnish with fresh lemon. Do not be put off by the addition of Elderflower Vinegar in the cocktail. Please be brave and try it, you will be pleasantly surprised! Our Citrus Sundowner Cocktail is a drink designed to make you feel alive and kicking. Best drunk on a warm evening with friends as the sun goes down, it will revitalise the parts that other cocktails fail to reach. You can buy the ingredients for this cocktail as our Citrus Sundowner Cocktail Set. This is a long drink refreshing drink, so choose a high ball glass or increase the quantities and add to a pitcher for larger parties. Add the measures of Lime Vodka, Seville Orange Gin, Ginger Wine with plenty of ice to a glass. Then add the juice of a quarter of fresh lime and a quarter of fresh lemon. Top up with tonic water, stirring gently. Garnish with small segments of lime, lemon and orange. Drink slowly facing into the setting sun, and feel happy! Like all good things in life this cocktail was created by chance and circumstance at a 50th birthday party with friends in Perthshire, Scotland at the end of May. One balmy warm Spring evening, we needed a celebratory drink for the birthday girl, Catriona. With the basic ingredients of Lime Vodka Liqueur, Seville Orange Gin and Ginger Wine to hand, the Citrus Sundowner Cocktail was born, AKA Catriona's Citrus Sundowner. This is a delightful drink that is so fresh it will make you feel young again...well almost! If you are a gin and tonic drinker who simply enjoys a delicious tasting gentle drink at the end of a hard day, then our Evoque Cocktail is your drink. At its core is our Gooseberry Gin Liqueur which is a legendary drink in its own right. Full of flavour with an exciting bitterness, its sophistication has even impressed some of the UKs leading wine critics such as Oz Clark. Briefly shake Gooseberry Gin Liqueur 17% and lemon juice with ice, strain into a champagne flute or cocktail glass and top up with chilled tonic. Garnish with a slice of lemon or a few red gooseberries for serious style. Our Gooseberry Gin is simply delightful over ice, but when drunk long with tonic, it will certainly evoque the mood, but not destroy the intention! You might say our Evoque Cocktail is fun, safe and more rewarding than anything else in its class.... a bit like the car that inspired it. This is a play on the traditional Whisky Mac Cocktail with a naughty twist at the end! The ingredients produce a deliciously warming and gingery drink with an unexpected cidery note. If you are looking at finishing a dinner party with a buzz of admiration rather than a yawn of dissent, then there is nothing quite like this simple cocktail with which to impress your friends! Shake and serve over plenty of ice in a tumbler (rocks) glass. Garnish with a slice of fresh apple on the rim. If you like your drinks sharp and refreshing then this might be just your tipple! Fill a collins glass 3/4 full with ice cubes. Add the Lime Vodka, lemon juice and sugar. Top with club soda. Shake and serve over plenty of ice in a tumbler (rocks) glass. Add a thin slice of root ginger to the edge of the glass. It may look simple, but this drink has the ability to turn spring into Summer, even in Scotland. So, break out your BBQ and head for the garden as our Elderflower Cooler cocktail will start your party with refreshing style! Use an old fashioned tumbler or rocks glass. Pour Elderflower Vodka and Lemon Vodka Liqueur measures over ice, top up with soda and garnish with a slice of lemon. Easy peasy lemon squeezy! This cocktail was created to mark Saint George's Day, normally on 23 April. It needed to be quintessentially English, seasonally fresh and with a bite like Saint George's slain dragon! The result is a sharp, fresh cocktail with a little history of its own. Our Somerset Applecart cocktail combines the brilliantly smooth apple taste of our 10 Year Old West Country Cider Spirit 42% and the delicious marmalady twang of our Seville Orange Gin 26%. Add ingredients to a cocktail shaker filled with ice, shake and strain cocktail glass. Garnish with slices of lemon and orange. Drink slowly to unleash the dragon! I always like a twist of cocktail trivia with each of our cocktails as there is generally an underlying reason for each creation. This one certainly appeals to my military roots as our Somerset Applecart is a derivation of the famous Sidecar cocktail created after the First world War at Harry's Bar in Paris. The story recounts that an Army Captain was in the habit of arriving in a chauffeur driven motorcycle sidecar at the Bar and that Harry created a cocktail for him. Using cognac, cointreau and lemon juice he created the drink known now as a Sidecar. Our cocktail uses this marvelous complement of tastes and the best of British handmade drinks to create a new English classic the Somerset Applecart! Edinburgh Apple Royal was a cocktail created to celebrate The Royal Wedding between Prince William and Miss Catherine Middleton which took place at Westminster Abbey on 29 April 2011. It is a deliciously spring fresh aperitif, with a distinctive taste of apples and a hint of citrus. This drink brings together the finest taste of British apples used in the production of our Somerset Pomona 20% and the Spring freshness of our marmalady Seville Orange Gin 26%. Add ingredients to ice in an old fashioned whisky tumbler, top up with indian tonic water and garnish with a slice from a very British Apple such as Kingston Black, Harry Masters Jersey or Brown Snout! Like everything at Demijohn there is a good story behind the creation of this new cocktail drink. 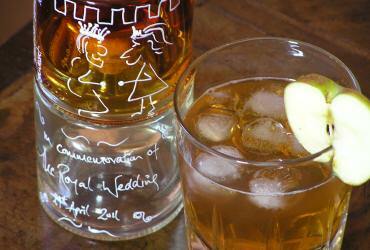 Our Royal Wedding Cocktail was to be both fitting, appropriate and drinkable in Royal circles. To encourage some ideas we held a friendly competition between our 3 shops, with the intention of the newly created drinks being judged at our annual Staff Christmas Party. In 2011 it was held in our Glasgow Shop in early February. The theme for the party was A Twist on Burns and those in attendance not only performed acts of poetry and music, in keeping with the tradition of Burns, but they also wore an item of fake hair! The prize for the best cocktail was relief for the creators from the fake hair they were wearing for the remainder of the party. 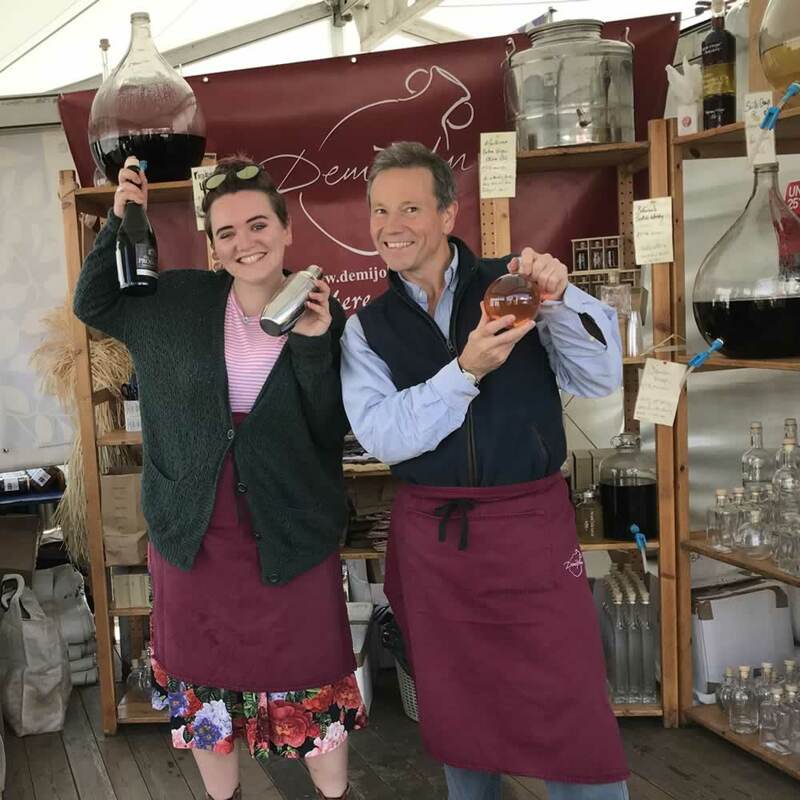 So, competition on the night as you can imagine was stiff, but Demijohn Edinburgh won with their fabulous creation Edinburgh Apple Royal, a fitting and appropriate drink for even the finest State ceremony and certainly a drink to mark the Royal Wedding! I first discovered this drink in Hong Kong when I was involved with its handover to the Chinese in 1997. It was hot, hot, hot and we had many reasons to party. Records do not recount how many of these delightful Seabreeze cocktails were consumed, but their refreshing memory lingers on to this day! If you are having a Summer BBQ and it is a hot day, then I certainly can recommend one of these to wake everyone up and really get things going. Pour Grapefruitcello Liqueur and cranberry juice over lots of ice in cocktail glass. Garnish with a slice of lemon or lime. Sip slowly and enjoy the freshness. 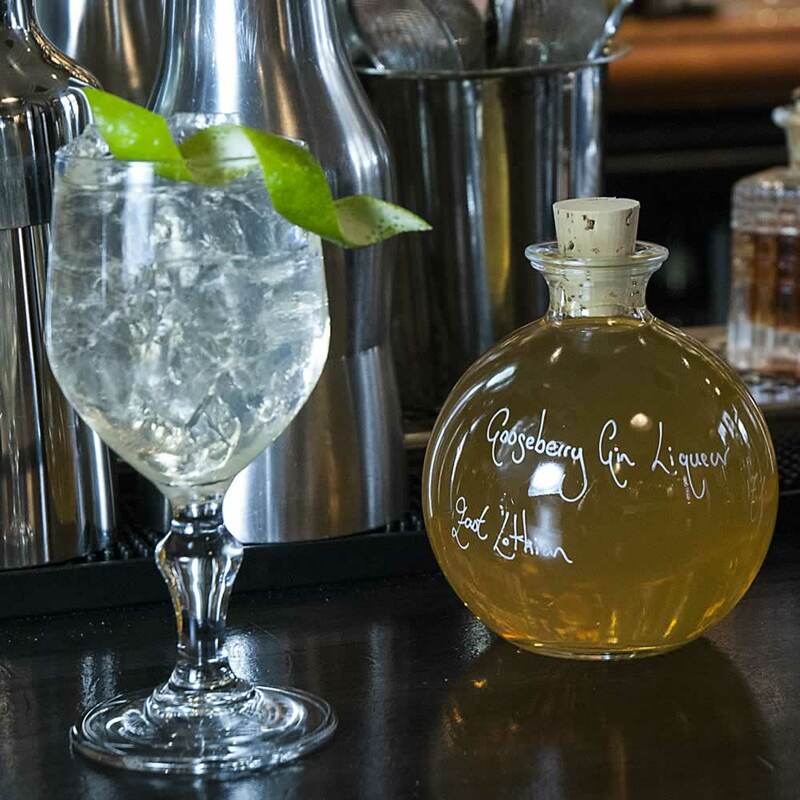 Combine our Demijohnnie Gin 50% and Elderflower Cordial in a tumbler with plenty of ice. Muddle with fresh mint. Hey presto! Warning, this is not for the faint hearted!